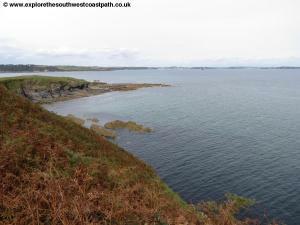 This walk is along the more gentle south coast of Cornwall. 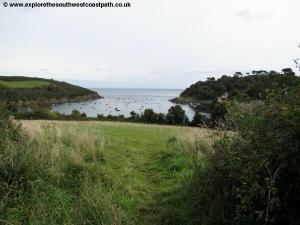 It begins with a walk alongside the beautiful Helford River to the pretty and remote village of St Anthony in Meneage. 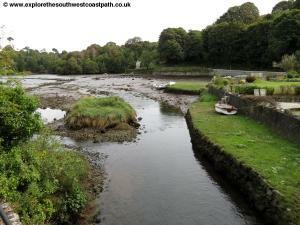 From here you can cross Gillan Creek either by walking around it at high tide or via stepping stones at low tide. There is sometimes a ferry available here at high tide. 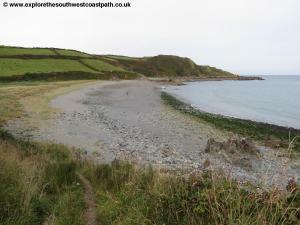 From here the walk heads east to Nare Point to re-join the sea and heads south to Porthallow along the coast. South from here most of the next couple of miles of the path is away from the coast (and some on roads) until the coast is rejoined south of Rosenithon where the walk continues along the coast to Coverack, passing a couple of quarries. 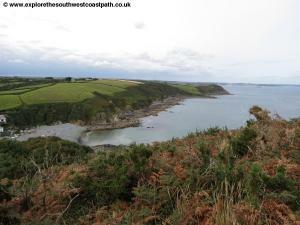 Note that although flat the last part of this walk can still be tough as the coast path is rough and rocky with numerous boggy areas. 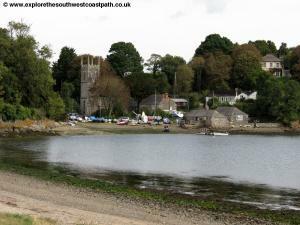 The start location for this walk is the village of Helford. This is in a fairly remote location along some narrow often single track country roads so care is needed. From the A394 at Helston exit onto the A3083 signed Lizard and RNAS Culdrose. Round RNAS Culdrose and at the next roundabout turn left onto the B3293 for St Keverne and Coverack. At the next roundabout turn left for Mawgan. Continue through the village of Mawgan. Keep straight on with the road at the next tw junctions soon passing the church on the left. Follow the road as it then narrows and heads fairly steeply downhill passing Trelowarren Mill. 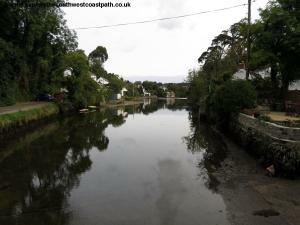 Soon you round a creek, near the top of the Helford River and then turn sharply right away from the river. Pass through the village of Gear, which has a farm shop and then around 100 metres later turn right on a minor and very narrow road. This drops steeply down into a valley and back up and then soon flattens out to run between fields. Ignore a junction with turnings to both the left and right and keep ahead (with the road). Continue on this road until you come to a T-junction where you must give way. Here turn left (signed for Helford). 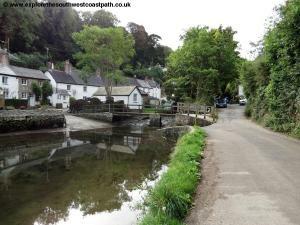 You pass through the village of The Nook and soon after at the well signed junction you turn left (signed Helford/Pedestrian Ferry Only). Keep with the road as it turns sharply left at a junction. 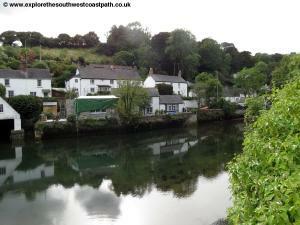 As you approach the village turn right into the car park beside the Down By The Riverside Café. This is a pay and display car park which includes public toilets. Beyond this point there is no parking or turning beyond that point and the road ahead is restricted to residents vehicles only for most of the year, so do not attempt to travel further by car. If you prefer to avoid the narrow and steep section of road you could travel via St Martin and Newtown in St Martin. 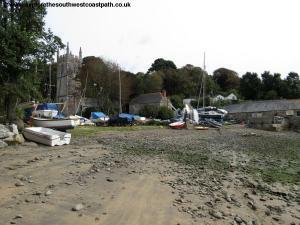 If you are using a Sat Nav be sure to select Helford and NOT Helford Passage, which is on the other side of the river. Note that if you intend to return to your car by public transport, there is no bus service to Helford. 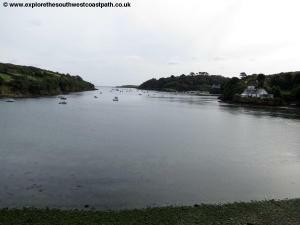 The nearest bus service is to Helford Passage across the river from where there is a passenger ferry (which does not run in the winter) over to Helford and from there around a 10 minute walk through the village back to the car park. You may instead prefer to park in Helford Passage (which has easier road access from the A39) and take the ferry over to Helford to reach the start of the walk. 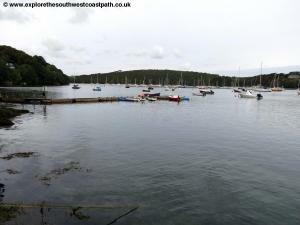 There is a small pay and display car park at Helford Passage. Another option may be to park in Helston, which has better road access and take the bus out to Helford Passage then the ferry over from Helford Passage to Helford at the start of the walk and the bus back from Coverack to Helston at the end of the walk, as if you return by bus you will have to change buses in Helston anyway. The Helford Ferry runs from 1st April (or Good Friday if earlier) to 31st October between 9:30am and 5:30pm. The ferry runs “on demand”, that is it will generally run when someone arrives wishing to use the ferry. 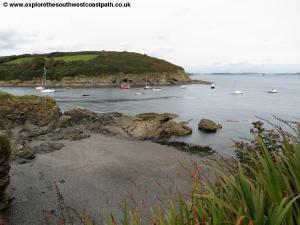 The ferry is based at Helford Passage so you can wait at the kiosk there. If you cross from Helford to Helford Passage you need to turn open the wooden blue circle so it shows yellow – this indicates to the ferrymen that you wish to cross. 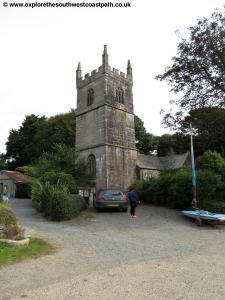 If you wish to take this walk outside of the ferry operating season be aware you will need to arrange your own transport to Helford and back from Coverack at the end of the walk as there is no public transport to Helford and it is not feasible to walk around. 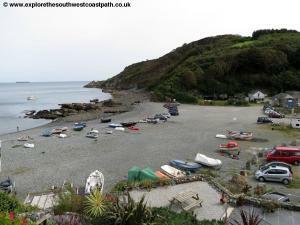 Another possibility is to park in Coverack in the morning and take the buses and ferry over to Helford in the morning so you can then walk back to your car without worrying about missing the bus. At the time of writing the bus schedule is shown as below including where to change buses. This applies Monday - Saturday only. Please check this as bus times do change quite regularly. If you are travelling by public transport as mentioned above there is no bus service to Helford, as it is a remote location. 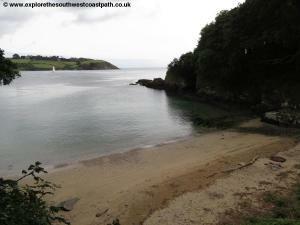 Instead you will need to take the bus to Helford Passage across the river. First Devon and Cornwall bus service 35 runs to Helford Passage. The bus runs broadly hourly Monday – Saturday and stops at Helford Passage Turn, which is at the top of the road at the junction down to Helford Passage and does not go down to the village itself. The village is a little under a 10 minute walk from the bus stop (but it is all down hill). The bus runs from Falmouth to Helford Passage where around half the buses terminate and around half continue from Helford Passage to Helston. Surprisingly given the remote location, this bus also runs on Sundays, running 4 times a day each way between Helston and Falmouth. 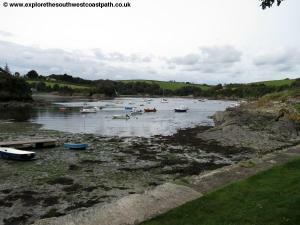 Falmouth has a railway station with trains running every 30 minutes from Truro Monday – Saturday and hourly on Sundays. You can change at Truro for longer distance services. In addition bus service 500, also operated by First Devon and Cornwall also serves Helford Passage although Monday – Saturday the service is very sparse with only 1 or 2 journeys to or from Helford Passage so consult the timetable carefully. This bus does however run 3 times a day on Sundays from Falmouth. 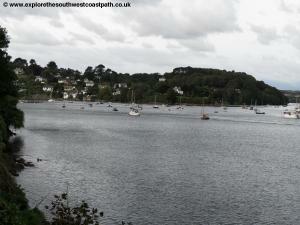 Once at Helford Passage bus stop take the road down hill to the village, which should take a little under 10 minutes. From here there is a ferry service from Good Friday (or April 1st) to 31st October and runs between 9:30am and 5:30pm each day but will run later into the evening in the peak summer period. A single journey currently costs £4. If you are travelling by public transport in the area around Falmouth a lot a Mussel Card is available. This costs £16 for 1 day up to £38 for 6 days and then allows free use of the buses, trains and ferries around the Fal Estuary, including the Helford ferry and both bus routes to Helford Passage (but NOT the bus from Coverack). 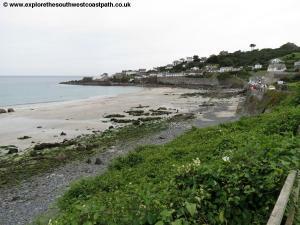 Due to the infrequent bus service to and from Coverack at the end of the walk this walk needs careful planning. 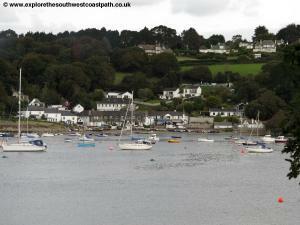 Accommodation in Helford and Helford Passage is limited as both are small villages. If you are after some luxury The Budock Vean Hotel is a 4 star hotel in Helford Passage. 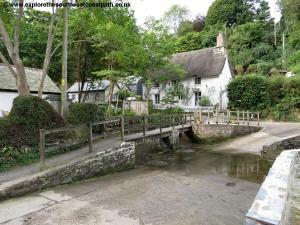 Helford Cottages have a number of holiday cottages for let in Helford village. 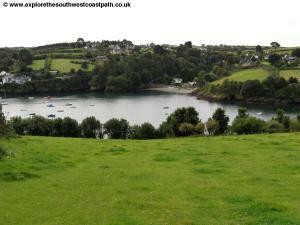 The Helford Hotels website also offers a number of self catering properties in the area. 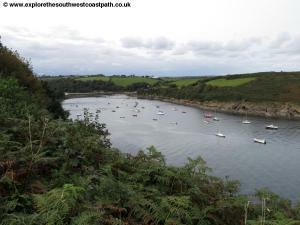 For a wider choice of accommodation the nearby towns of Helford and Falmouth offer a much wider range and both have bus links to Helford Passage. 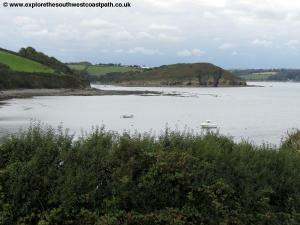 This walk starts from the ferry steps at Helford, which is where the ferry arrives from Helford Passage. 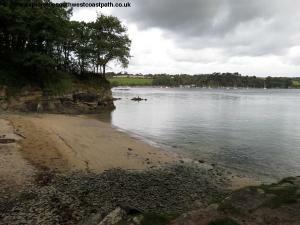 If you are travelling from the car park in Helford village this is around 10 minutes walk and the first part of the walk you will end up re-tracing your steps back to the car park. 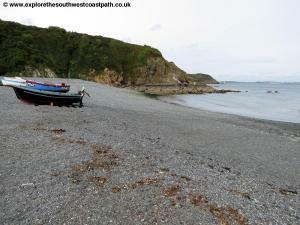 From the ferry steps follow the signs to the coast path, keeping the water on your left. Follow the path alongside the little creek where the path soon widens to a road passing some lovely thatched cottages, one of which is a pub. Follow this minor road up the beautiful little creek towards the centre of the village. 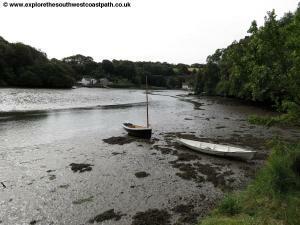 Helford is a delight and is in such a peaceful and secluded spot. Follow the road around the creek and then cross either via the road bridge or adjacent foot bridge. Once over the bridge turn left and continue along the other bank of this little creek. Soon as the road turns to the right by the entrance to the car park and the cage, take the wide track ahead, signed as the coast path. (Note that there are public toilets in the car park). 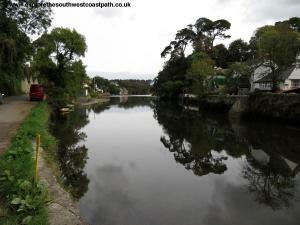 Continue on this track around the back of the marina and sailing club with fine views over the river. This track soon re-joins the public road near Treath. Keep ahead on this road but when the main route of the road forks sharply to the right turn off the road and continue straight ahead on the signed coast path, marked, Permissive Path to St Antony through the Bosahan Estate. The next mile and a half or so is along this permissive path rather than a public right of way (meaning the landowner has helpfully given permission for walkers to use this path, but it is not a legal right). 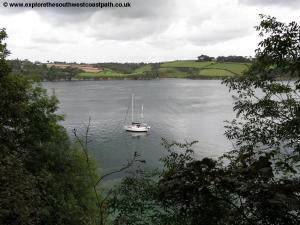 The path is good and much of it through woodland offering fine views over the pretty Helford river. 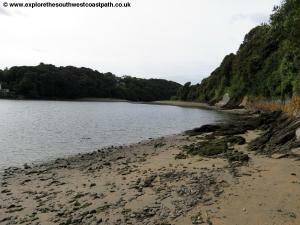 There is access to a couple of the beaches beside the river too. As you leave the trees the path starts to climb up onto Dennis Head. 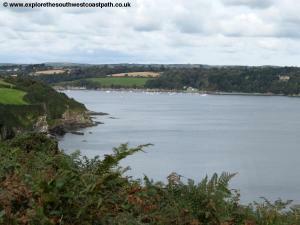 Continue right along the coast until you near the top of the headland where you then have views of water on both sides south over the Gillan Creek and north to Falmouth. The coast path almost doubles back on itself up on the headland but you keep to the left most path up to the end of the headland and then return to enter the field you walked in earlier but this time head to the oppoisite corner, diagonally across the field This soon leads to a track beside a house and then down to the waterfront in the little village of St Anthony in Meneage and Gillan Harbour. This is a pretty village in a very peaceful location situated on Gillan Creek. From the church the correct route is now along the minor road along the north side of the creek. 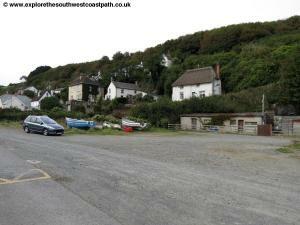 After around 300 metres along this road look out for the coast path sign to the left. This is the low water route which is to cross the creek on stepping stones. Care is needed here as the stones can be slippery. DO not attempt to cross if any of the stones are underwater or you canâ€™t see them, as the creek is tidal and the water can be fast flowing. If the stepping stones are covered you have two possibilities. The first is to take the ferry. Although not signed on the map or mentioned in the coast path guide book there is now a summer ferry service across the creek. This runs from April 1st to October 31st during working hours. It departs from the boat house on the north side of the creek. If there is no one around the phone number for the ferry is 01326 231357. This costs Â£3.00 each way if there are two or more people travelling or Â£5.00 for an individual. (If crossing from the other side open the wooden sign board to indicate you wish to cross). If the ferry is not running or you do not wish to use it you need to walk around the creek. To do this continue along the road. Soon you have a National Trust sign post with a sign warning of no bait digging on the left. Although not the official route this is a pleasant footpath away from the (quiet) road which goes through woodland and soon re-joins the road. The majority of the creek is treed-line and very attractive. As you near the north end of the creek you pass a few houses and then go round the bridge at the north end of the creek. Continue on the road round the other side. Shortly you again come to a National Trust sign pointing down from the road. This time the path is a dead end so unless you want to get to the view point it leads to it is best to keep to the road. Sadly the road heads inland away from the creek on the south side and you continue along this. As you reach the top of the hill and can see the road sign welcoming you to Gillan ahead, turn left on the signed public footpath over a stile (just before the trees beside the road end). Take this and head for the far (NE)corner of the field. Continue into the next field still going diagonally to the opposite corner of this field. Continue along the eastern edge of the next field ahead going to the left of a house and then down to a road. Continue straight ahead (NE) on this road, ignoring any ways off until you reach the coast. After more than 2 miles of walking you end up just a few metres away! Turn right here to continue along the coast path. If you have crossed by ferry or stepping stones, turn left once over the river. The path ahead leads to Gillan a pleasant little village on the south bank of the creek. 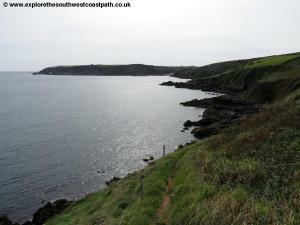 Follow the low path around the cliff top passing a couple of beaches on the left as you reach the mouth of the creek. 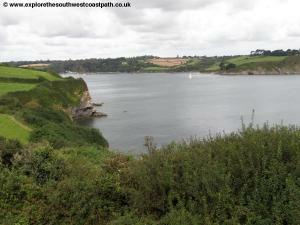 The path continues on fairly low cliffs around to Parbean Cove, a rocky and pebbly beach with fine views of the Helford River and on to Falmouth. Continue down over a little stream and back up at the beach and round to Nare Point. There is a coast watch station here which can often be visited. Do not take the gate into the grounds of the coast watch station but take the path just next to it as it begins to climb and we fully leave the Helford river behind. The coast now becomes hillier and rocky as you continue south right along the cliff top. Just north of Nare Cove the coast path shortcuts right from the coast but there is an alternative path right along the coast if you prefer. 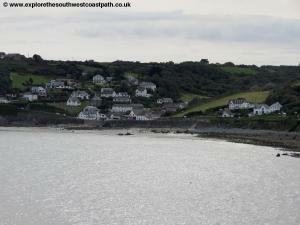 You can see your next destination ahead, Porthallow which is a pretty village with a shingle beach. There are toilets a pub and shop here. The path descends down to the beach here. It is a shame but unfortunately the next mile and a half of the coast path is not along the coast but follows a mixture of road and paths inland. At the south end of the beach follow the road out of Porthallow. After around 250 metres ignore the path off to the right. Continue as the road then turns right and shortly after this you turn left along the wide track signed as the coast path (inland route). This goes behind a farm and house and you continue on the wide track along the edge of a field. Continue along the edge of another couple of fields with the hedge on your left. This brings you out to a minor road. 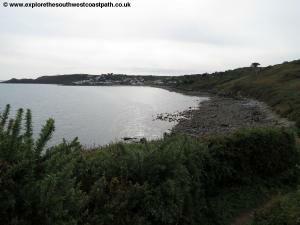 Here the official route of the coast path is straight on along the road. 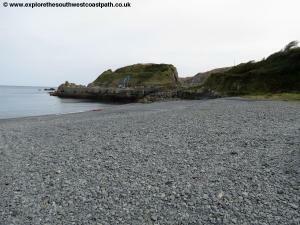 It is possible however to visit Porthkerris Cove which the coast path misses out, but it is a dead end route so you have to return the way you came. The return trip is around a mile and a half diversion. If you wish to do this follow the next paragraph, otherwise skip a paragraph. To visit Porthkerris Cove turn left along the road rather than straight on. Ignore a turning off this road on the right and continue straight ahead. The road twists and turns and soon you pass the sign welcoming you to the beach. Descend down on the road to reach the shingle beach. 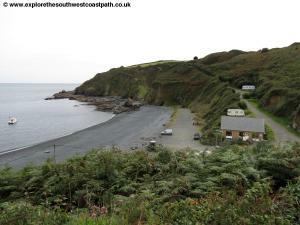 Porthkerris is also a diving centre and also has a campsite. Return the way you came as sadly there is no access along the coast from here at present. To continue on the coast take the road ahead heading south. After around 300 metres the road splits. Take the left fork (signed as the coast path). The road passes some houses (the village of Trenance) and soon turns to the right and the houses end. After this the road curves gradually but then comes to a sharp left hand bend. 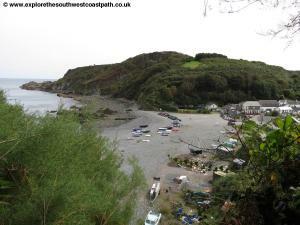 Just before this turning look out for the coast path signed on a wooden post to the right. Here you enter the field and head for the south east corner of the field. Cross into the next field and turn left and again head for broadly the south east edge of the field. This leaves the field and comes to a minor track next to some pretty thatched cottages. Continue straight on down this road into Porthoustock. At the back of the beach by the Olde Lifeboat Station continue along the road. To visit the beach turn left here and follow the short path down to the shingle beach. 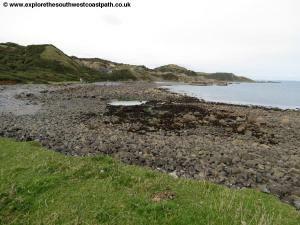 This area has been heavily quarried and quarrying still goes in, which is why the coast both north and south of the beach is inaccessible and there is the remains of some old buildings and a small harbour wall at the beach. South of here we again leave the coast so follow the road out of Porthoustock. The road climbs steeply out of the village and at a junction go straight on, still up hill passing the access road to the quarry on the left. 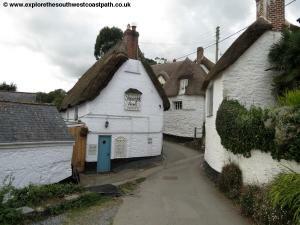 You pass a house on the left and just after this fork right off the road onto the coast path (over a stone stile). Here you take the path going due south west straight across three small fields to re-join the road (cutting a corner). Turn right when you rejoin the road and follow this into the pretty village of Rosenithon. When there is a road off to the left (by a house with a post box in the wall), turn left on this minor road between houses. 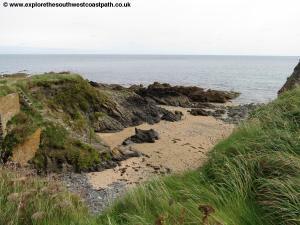 You now follow this road as it narrows to a track and heads due south east to reach the coast at Godrevy Cove, a shingle beach that feels quite remote with few buildings visible. Turn right here and follow the path behind the beach. 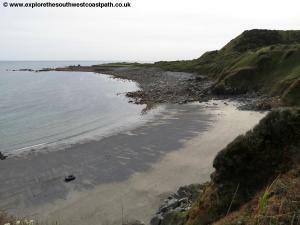 The path climbs away from the beach and soon enters the rather ugly Dean Quarry. 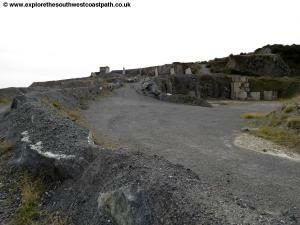 Although the coast path book warns of watching for the red flags here indicating blasting is taking place I donâ€™t think this quarry has been used for some years. Follow the very well signed footpath around the coast beside the quarry. 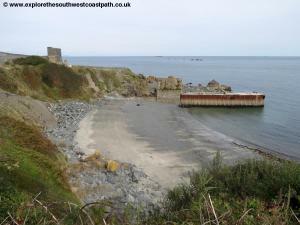 Pass the old jetty and continue along the coast path soon leaving the quarry. 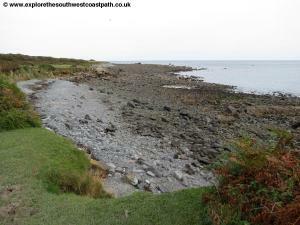 The path now heads out to Lowland Point where you turn the corner and start heading west rather than south with your destination, Coverack now in site. 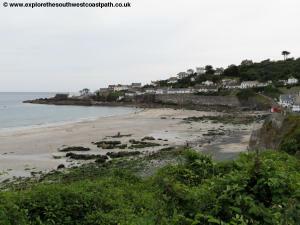 Coverack is around 2 miles away and the path relatively flat but is much tougher than you might think. This is because it passes through an area that is very rocky, so the path is uneven with rocks and boulders to climb over mixed in with some very boggy section with stepping stones in places. This makes it hard going and it will probably take you longer than you think. Soon the path climbs up to reach the minor road that heads down to COverack. Follow this past houses and down to the little green where there is the bus stop and the car park a short distance away. The walk ends here. 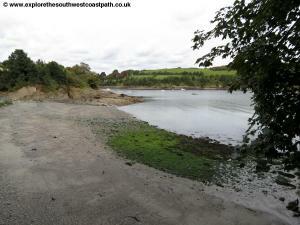 If you are returning to Helford it can be something of a challenge as mentioned earlier. From Coverack bus 36 runs roughly once every 2 hours, Monday – Saturday only and goes to Helston. There is no Sunday bus. This bus is operated by First Devon and Cornwall. Most buses run via St Keverne square on the way, where the bus turns around (although one or two run from St Keverne first and on to Coverack second) and take around 40 minutes to Helston Tesco and another few minutes to the town centre. From Helston bus service 35 runs once every two hours Monday – Saturday and 4 times a day on Sundays to Helford Passage Turn. Check the timetable carefully as connections at Helford can be poor and not all buses go to Helford Passage. One or two buses also run as route 500. The journey to Helford Passage Turn takes around an hour and from there it is a 5-10 minute walk down to Helford Passage quay from where you can take the ferry over to Helford. This runs “on demand” from Good Friday or 1st April to 31st October from 9:30am to 5:30pm but later in the summer. In winter there is no ferry. Due to the time taken (and cost of 2 buses and a ferry) it will certainly be quicker to take a taxi and may also be cheaper for more than 2 people. In the winter when the Helford Passage to Helford ferry runs there is no way back by public transport – you will have to call a taxi. Due to the difficult transport it is advised to do the journey at the start of the walk. See the “Getting to the Start” for details of buses in the morning from Coverack to Helford Passage. 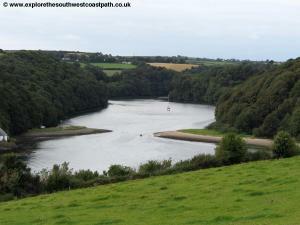 Ordnance Survey map 103 (Lizard) covers this area of the Cornwall coast. It is widely available both locally and in bookshops nationwide as well as online retailers. The links below also show a map of the walk.